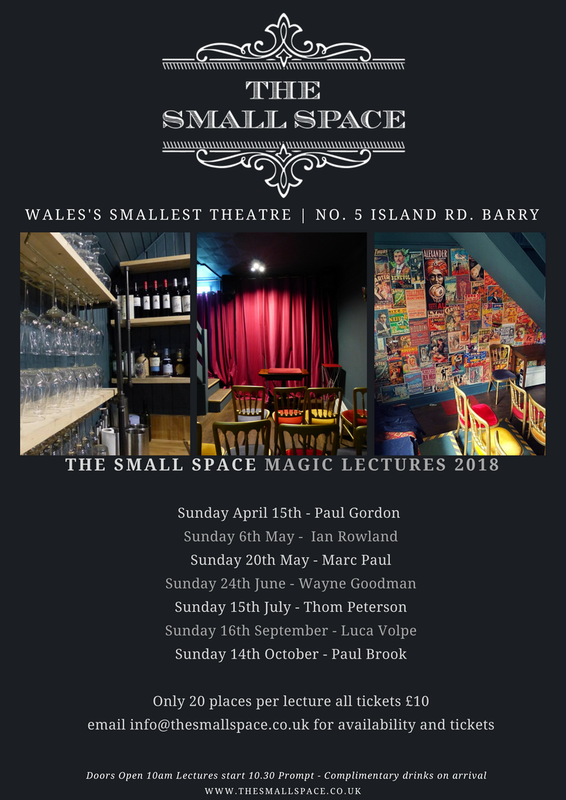 We’re delighted and excited to see a new entertainment venue in the area; even more so the fact that it’s primarily a magic venue and just happens to be the smallest magic theatre in Wales, possibly the world! We are very lucky to have been offered pre-release ‘first dibs’ on seats at this 20 seat venue for a stellar line-up of magic lectures this year. In addition to the ‘Resident Magicians’ performances there are a number of visiting magicians from across the UK and overseas who will be performing a public show and then presenting a private lecture the following day. At the moment these are all ‘Saturday night, Sunday morning’ arrangements. Tickets for the shows are £20 and the lectures £10. All tickets MUST BE BOOKED IN ADVANCE owing to the nature of the venue (small!) so there will be no ‘walk ups’ on the night/day.
) to secure your space. If you’d like to attend a show, you can book tickets via The Small Space website (here) or the Facebook Page (here). Get in quick though as interest is already building for these exclusive tickets before their official release. Have a look at the poster here for names and dates of lectures… it’s a great line-up!